Meg Bernier (@msteverb) is the assistant director of editorial services and social media in the communications office at St. Lawrence University. Have you ever had to convince your colleagues that the time you spend on social media isn’t just about likes and retweets? I have just the story for you. The St. Lawrence University alumni office launched a really cool product to engage alumni earlier this year—a free, custom box filled with school spirit items for alumni and parents to use at gatherings like weddings and graduation parties. We promoted it in many of the same ways we promote other initiatives—we put an ad in each of the last three alumni magazines (which are extremely well-read) and encouraged our development officers to spread the word when meeting with alumni and working at regional events. 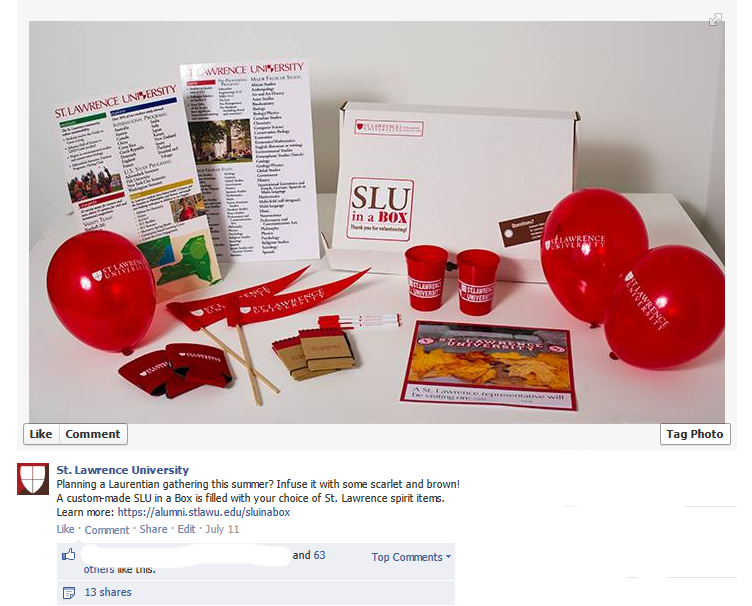 As of mid-July, the alumni office had received 15 requests for the custom “SLU in a Box” product during a period of six months. Because it was mid-summer and gatherings were in full swing, I thought it would be a great time to promote the custom boxes on social media. You can imagine my excitement when I saw the engagement with our Facebook post. But, the average number of likes and a slightly above average number of shares the post generated isn’t what was most exciting—it was that in just 80 hours, the program had grown from 15 requests to 34, a 126 percent increase. The post went up at 3 p.m. on Thursday, July 11 and by 4 p.m. the same day, Haley Feickert, our coordinator for the project, had received nine requests, with another six coming in that evening. By that Sunday afternoon, four more requests came in. For a small school like ours, this is an impressive feat. In a short amount of time, we engaged with 19 alumni, who then shared the contents of the box with other alums (and non-alums!) at their events. It’s unrealistic to think development officers can be at every single alumni gathering and event or that all alumni can make it to the ones we host, but “SLU in a Box” helps bridge the gap by providing alumni and parents with a little something to strengthen the connection that brought many of them together in the first place. “We wanted our alumni and parents to know we’re still here for them and they are still an important part of our community even if they can’t make it to our events,” Feickert said. She noted that recipients of the box return a list of the names of guests with their respective class years, along with a photo from the event. All of the information gathered is added to our database. Meredith Perry, a 2007 graduate who requested a box on the day the Facebook post went up, noted that she’s not a frequent Facebook user (she prefers Twitter and Instagram) but the post showed up at the top of her feed on the night of July 11, more than six hours after it was posted. Social media is a great way to help real-world initiatives take off. It puts the product or idea immediately in front of the people who might care about it and allows them to provide instant feedback—our alumni made suggestions that are being taken into consideration for future box ideas. Through just one Facebook post, we were able to give our alumni and parents something they wanted, increase alumni engagement and validate the use of funds and staff time spent on social media. These results were far more valuable than a like or a retweet. I love this idea of [name] University in a box! In terms of engaging alumni, it is a perfect way to give them a value add to one of their events or get-togethers. For the person who requests the box, it can make their party amazing, because they get to show off their college pride. For those who might not be as engaged, it shows that the university is there to help out when needed. Using social media is a fun way to share information about the program, too. You can post a picture of the box, which people would be excited to see, and can drive people to your website. Our office has fulfilled some requests by alumni, where we’ll send some swag, like sunglasses or pom poms. Since SU has such a large alumni base, our office would have to be careful that we didn’t get inundated with requests for a box like this. Perhaps limiting the requests to those who have served in a volunteer role, at first, would be a good way to gauge interest. I would also include a hashtag on the box so people would know to tweet and post pictures of those at their party using the box’s content. Then, we could post pictures (with permission of course) to our social media channels and website. Such a fun and effective idea!